These underwater plants are very important to the pond ecology. They contribute to clear water as well anything else you might put into your garden, sometimes referred to as "nature's filter". To be the most effective, they should be stocked at the rate of one bunch per one to two square feet of pond surface area or one bunch for every 12 to 24 gallons of water. Besides helping water quality, these plants provide cover and protection for adult and baby fish. Goldfish will spawn on these plants, attaching eggs to the foliage where they soon hatch. Fish fry will be protected from adult fish until they can grow larger. Stock early to be able to get all benefits of these important plants. To flower and flourish, a water lily needs care like any other perennial. Proper sunlight, soil, fertilization, water depth and pruning will determine the success of the plant. Plant only in clay-based topsoil in an aquatic pot (no holes). Water lilies begin putting up their first floating leaves in early April. The first ones may be smaller or darker in color than later ones. As the season unfolds, the leaves get larger and begin to shade the water below, cooling and moderating temperature fluctuation. Each leaf lives three to four weeks then turns yellow and dies. Prompt removal of yellowing leaves at the soil level encourages new leaves appear. In May, the first flowers reach the surface, opening and closing daily for four days each. As a flower is spent, it will slowly sink into the pond and should be pinched out to promote more flowering. Hardy water lilies flower May until September, with the peak season in June through August. Position the water lily so that it receives at least five or more hours of direct sunlight. The afternoon sun is best. Some varieties will flower at a reduced rate in less sunlight. More sun means more flowers. A pond in full sun is preferred. Do not worry about the water being too hot for the fish, remember, the water lily is keeping the water cool. Good quality topsoil is used as the growing medium. Clay-loam soil from a vegetable garden or lawn is commonly used. Do not use a bagged soil unless it is specifically labeled for aquatic plants. Lightweight soil amendments are to be avoided, as they will float. Avoid subsoil with a layer of fine gravel to keep the fish out and the soil in. Use a planting container that is as large as your pond can accommodate. Larger soil volume mean bigger flowers and leaves. A pot that is wide instead of deep is preferred. Place the pot at the bottom of the pond up to three feet deep. Allow a minimum of ten inches of water to cover the soil surface. Note shallower requirements of some smaller varieties require placing the pot no less than eighteen inches deep. Position a plant less than the preferred depth and quality of flowers will be reduced. Be sure the roots are below the freeze line in water. Plant the water lily according to the photo below. 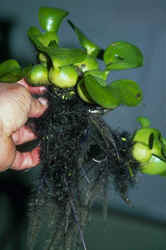 The rhizome (root) is positioned so that the cut end is against the side of the pot, not in the middle. This gives the root as much room as possible to spread across the pot. Regular fertilization will keep your water lily blooming and growing well. Fertilizer tablets are pushed into the soil at planting time and from April through August. Follow the manufacturer's recommendation for fertilizer application rates. Locate the water lily so that the floating leaves are out of the turbulence of the waterfall or fountain spray. 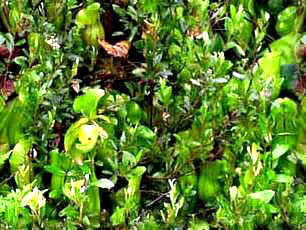 Water splashing on the top of the leaves will discolor or destroy them. With large, bold leaves standing high above the water, the lotus is a midsummer treat, fragrant colorful blossoms sometimes reaching twelve inches across. The first leaves float on the pond's surface like a water lily. As summer approaches, the emerging leaves are held well above the water, setting the stage for the summertime display. In July the flower buds begin to develop until the flowers burst forth for an eight week spectacle, The heady fragrance carried through the garden is a bonus to the stately flowers. As each flower begins to fade, the petals drop off, revealing the exotic seed head, a common component of dried floral arrangements. The Ultimate size of a lotus is determined not only by the variety itself, but also by water depth, soil volume and fertility. This hardy perennial will give years of enjoyment when provided with nutrition and space. The plant should be given ample soil to allow full development. The new plant should be placed in a ten gallon or larger pot (except small varieties) as shown in the illustration. Care should be taken when handling the tuber to keep the growing point intact and protruding through the soil surface when planting. The best soil is a heavy clay loam that will anchor the tuber as it develops. A light layer of gravel is recommended except where the growing tips are. Care must be taken to avoid obstructing the new growth. After planting, the lotus should be placed in water four to ten inches over the soil surface. Once the lotus is established, it will grow well with twelve to eighteen inches of water over the soil the year round. Do You Want a Lotus and Don't Have Room in the Pond? Sink a pot of lotus into the ground beside the pond or anywhere else in your garden. A lotus planted in a ten gallon pot will over-winter in Zone 6 when buried in the ground to the rim of the pot. Use as large a pot as possible to accommodate the plant. Fill up to two thirds full with soil, leaving the rest of the space for water. Control mosquito larvae by floating a Mosquito Dunk in water each month or put a goldfish or two in the water if there are five gallons or more. Planting is simple with floating plants, just toss them in and they float according to the will of the wind. Buoyant leaves keep these plants afloat, making the great natural spawning areas for fish as well as protection for fish, large and small. Their best contribution to the pond, however, is the enhanced water quality that you get from them. The roots dangle in the water and readily absorb organic pollutants. They also form a very aggressive mat of plants that shade the water below, keeping it cool and dark, thus reducing algae growth. As an edge planting, push roots between rocks on the submerged edge of the pond. These "planted" floaters will root among the stones, and will often grow fuller and flower better. Hyacinths will also adapt well to planting into the stream bed where the water rushes over the weighted down root system. Good, inexpensive, quick cover for new water gardens. Hyacinths prefer full sun and Lettuce prefers light shade.